South Lake Tahoe, located at the south end of Lake Tahoe and just across an invisible border from the casino’s in State Line, NV, is the primary city in the Lake Tahoe Basin with a population of 23,000 people. The cities location is simply beautiful, with the vast blue waters of Lake Tahoe marching off to the north, while numerous tall, snow-covered peaks loom over the city to the south and west. South Lake Tahoe, due to the wide varieties of outdoor activities nearby and the simple beauty of Lake Tahoe, draws in tourists and visitors year-round. As such, the downtown area of South Lake Tahoe can be a busy place during much of the year. However, it is during the summer – especially on weekends – when the city overflows with people and vehicles. Those searching for areas “less traveled” will want to avoid South Lake Tahoe on summer weekends! Owing to its location, South Lake Tahoe is one of the primary cities in the Tahoe Basin for outdoor recreation. The huge Heavenly Ski Resort is located right in the downtown area, with a gondola whisking skiers and sightseers high up into the mountains. South Lake Tahoe also has many marinas and boat launch facilities, and thus serves as one of the primary boating hubs in the Tahoe Basin. 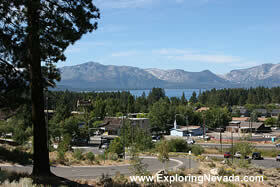 The city is also located near some of the finest hiking and mountain biking trails in the Tahoe Basin, too. As the primary business in South Lake Tahoe is tourism, there is no shortage of services in the city. 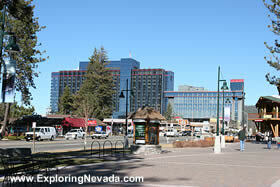 There are dozens of hotels and vacation rentals, from budget to luxury, in the city and nearby Stateline, NV. The city also has a huge variety of restaurants, defying the relatively small size of the population. For those who plan on visiting South Lake Tahoe during the busier periods (weekends during ski season and during the peak summer period of July-September), should make reservations well in advance of their arrival.